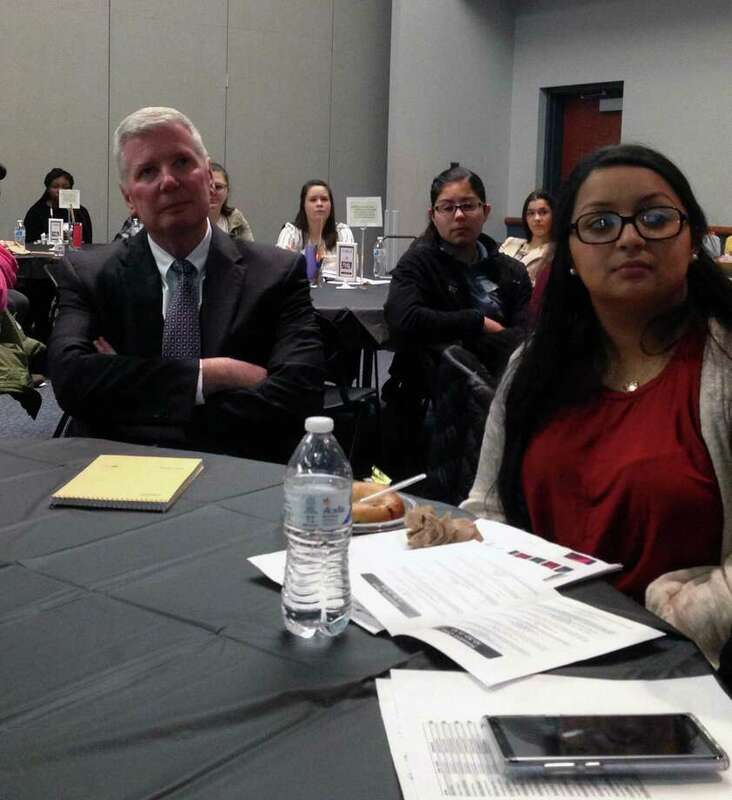 Fairfield Warde Principal David Ebling and student Erika Romero at the Identity and Education Conference, March 29, 2018, at Southern Connecticut University in New Haven, Conn.
FAIRFIELD — More than 80 students from throughout the state met last week for the second Identity and Education Conference, organized by the Fairfield Warde student and staff. The conference, hosted jointly by Warde’s Achievement Gap Task Force and the Southern Connecticut State University Graduate School of Education Minority Educator Initiative, at the Michael J. Adanti Student Center on Southern’s campus. “It was very, very different than our first one, it was statewide outreach and we think we did a really good job for our first statewide conference,” said Deirdra Preis, Pequot House housemaster and founder of the task force that seeks to remedy the achievement gap for students on free or reduced lunch and students of color at Fairfield Warde High School. As opposed to the first conference, held in 2017, Preis and a group of her students, who began sharing their stories as minorities in a mostly white school at professional development meetings for staff, invited other students from Warde and from Bridgeport. The Fairfield students were able to interact with students from a vastly different district, but still found commonalities. This year, the Task Force took a broader approach, welcoming high school and middle school students from schools in Meriden, Greenwich, Fairfield, Bridgeport and college students from Fairfield University, Columbia University and Southern. David Hollingsworth, a clinical psychologist and assistant professor at Fairfield University, delivered the keynote speech, putting special focus on micro-aggressions and the ways in which they can impact students who are different from their peers in some way, whether it be their gender, ethnicity, race or some disability. “Micro-aggressions can impact a person’s mental health. David talked about the fact that, when someone makes a comment and you’re taken aback by it, you can be focused on that rather than what’s going on in the class,” Preis said. Following Hollingsworth’s speech, attendees were able to choose from a variety of student-led workshops, with titles that ranged from “Embracing Cultures in Diverse Classrooms,” to “Black Women in PWI (Private White Institutions)” that tackled topics like multiculturalism, sexuality and the needs of first-generation students. “The students did a tremendous amount of work,” said Preis, noting that the organizers from Warde had to review each of the workshop proposals and work closely with schools to develop ideas and hone the presentations. Warde Headmaster David Ebling, who gave opening remarks, was adamant in his praise for the conference.